A new soda has hit the market, and Sierra Mist Natural Lemon-Lime Soda is its name. Heavy advertising and a wonderful sale price compelled me to complete a thorough review. Some information about the beverage is in order. 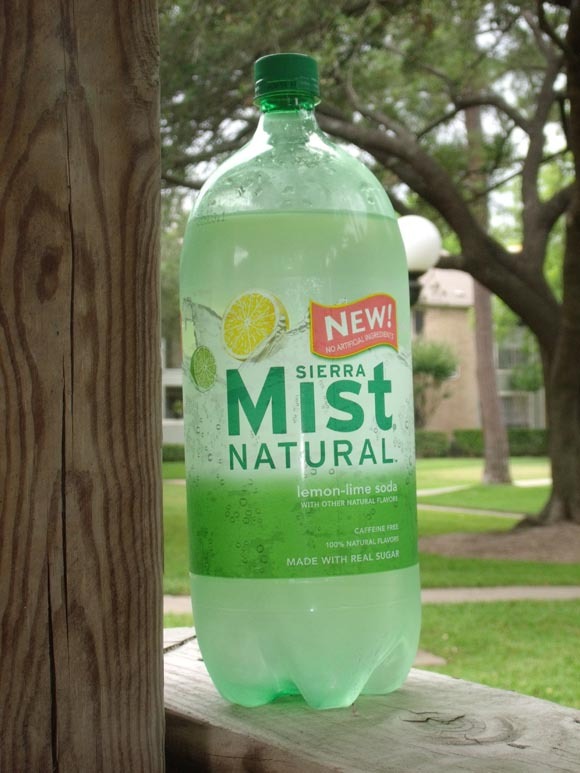 Produced by Pepsi, Sierra Mist Natural has seen more than one incarnation. From 2000 to 2010 Sierra Mist was sweetened with High Fructose Corn Syrup, until the recipe and the name was reformulated. In 2010 Pepsi decided to use a more natural form of sugar and switched to sucrose instead of HFCS. Pepsi also paired down the total number of ingredients and added the world "natural" to the products name. Now Sierra Mist Natural is made with carbonated water, citric acid, natural flavor, potassium citrate, and the aforementioned sweetener. This drink looks good to me so far, and I hope it's respectable outward appearance isn't masking a rot-gut style quality. So with a cold bottle and an open mind I dive into Sierra Mist Natural Lemon Lime Soda. The label informs me that it is caffeine free, which I like. So I open the top and pour a tall glass. (Just in case you’re wondering, I bought a three liter bottle.) It smells like any lemon lime-cola one may encounter, and is crystal clear. A generous gulp is eagerly drank. This tastes promising! Equal amounts of carbonation and lemon-lime flavor are present and neither are overpowering. Another sip is taken to ensure a correct reading. Yep, it still tastes well above average, and the taste as well as the carbonation remains static throughout the review process. Overall my impression is positive, and I think I would purchase another bottle. Even if it’s not on sale. So I now have the rest of a three liter bottle to drink and not dump out. The small victory column now has an addition. Perhaps now I can have friends over. Final review: Buy A Bottle! Choosing a soda with no artificial ingredients is a solid decision in my opinion, choosing Sierra Mist is equally as solid considering its taste and value.